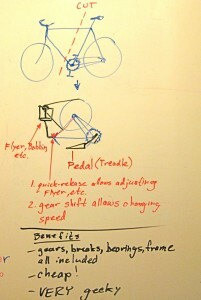 An idea for converting an old bicycle frame to a spinning wheel. 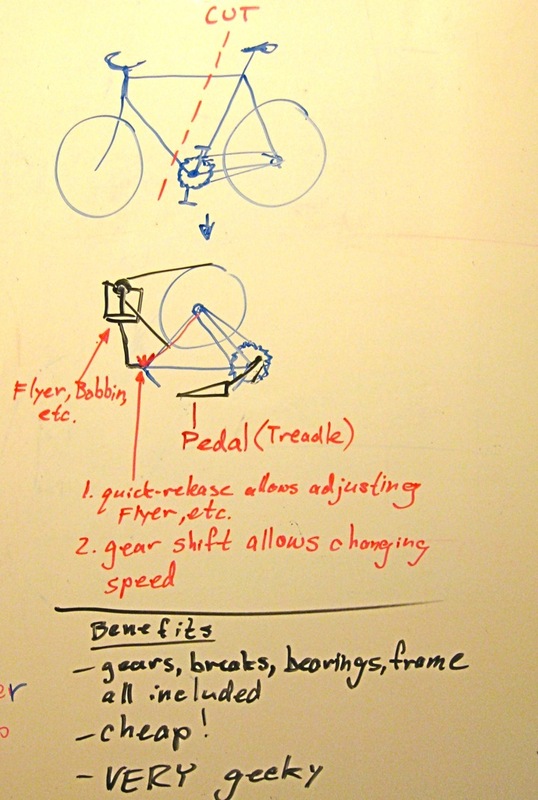 Was just pondering spinning wheels since my housemate’s boyfriend built her an electric one that works pretty good. However, it IS electric which means it is still post-industrial revolution and requires a 110V 60Hz power hookup. What if you cut a bicycle frame (see photo) such that the sprocket, gears, rear wheel, and seat were all still intact. You could attach a treadle to where the crank-shafts once were and make sure the rear hub couldn’t rotate freely. You could run the gear changers (if it’s a multi-speec bike) up near the seat post allowing the spinner to change speeds. With the wheel no longer on free-rotate, the break would be unecessary. The flyer, bobbin, and other-parts-I-don’t-know-the-names-of could be attached to the seat post and the quick-release used to quickly adjust distance from the wheel or to remove that section for necessary repairs, loading, etc (again I don’t know enough about spinning wheels to judge what is necessary there).